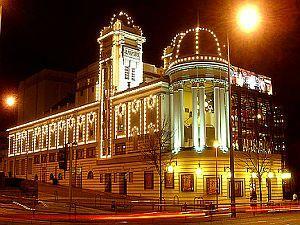 Alhambra Theatre01274 432000work TheatreThe Alhambra Theatre is the jewel in the crown of Bradford. Built in 1914 and refurbished in 1986 with stunning results. Today, the Alhambra is regarded as the North's premier touring venue and hosts the best in large scale entertainment from ballet and opera to variety and comedy, musicals, drama and, of course, the annual pantomime. Regular visits are made from prestigious companies such as the Royal Shakespeare Company, Northern Ballet, Disney Theatrical, the National Theatre, Matthew Bourne's New Adventures and David Ian Productions. Enjoy a pre-theatre meal at the sumptuous Restaurant 1914 or upgrade your booking for any Alhambra Theatre show and gain access to the VIP Laidler Room. The Alhambra Theatre is the jewel in the crown of Bradford. Built in 1914 and refurbished in 1986 with stunning results. The facilities of the building and high quality of the programme ensure that the Alhambra Theatre is popular with patrons throughout the region as well as being a source of pride in Bradford.